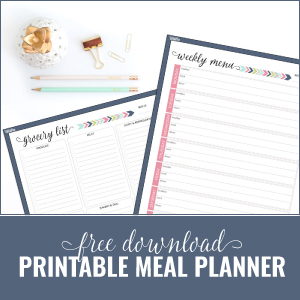 The other day I shared our Meal Plan for Week 2 with you for our 30 Days of Real Food Challenge. You may have noticed that we are eating Spaghetti–again–this week. Since it’s easy to put together, and my hubby is really good at making it, I will usually have him make that for dinner on Thursday nights. It really helps out since I don’t get home until after 7:30. I’ll admit, I’ve always bought my marinara from the store. Usually I would get whatever brand was on sale and I had coupons for–making my out of pocket cost pretty cheap–another reason why we eat Spaghetti a lot. You can’t beat Free pasta and almost free pasta sauce. And you could get 2-3 meals out of each box and jar. Even better. So starting this real foods journey, I still want to keep things as inexpensive as I can. Problem? Not only does the all natural whole wheat pasta cost more, but the all natural marinara that I’ve been able to find is $3+ a jar. That is a big jump considering I am used to pay nothing up to $0.75 a jar. So my solution? 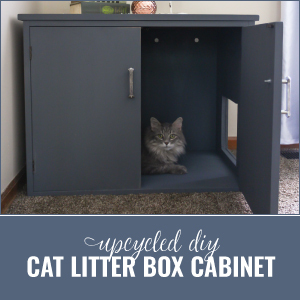 Make it myself–duh! I mean really it’s not a hard concept. If you have tomato sauce, or crushed tomatoes, all you really need to do is add some spices and simmer it together for awhile. 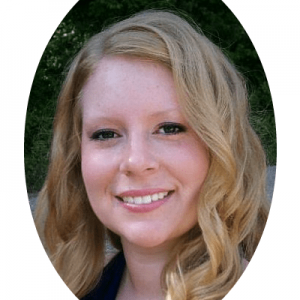 I took it one step further and decided–why not let it simmer away in the Crock Pot? That way I don’t have to stick around while it simmers on the stove–I can go out and do things that have been on my to-do list for weeks. For starters, my container garden needed switched around, the tomatoes needed staked up before they started bearing fruit, and Delilah needed some exercise. The Crock Pot was the perfect solution. I forgot to put a green pepper in this photo–it wasn’t until I had chopped up the onion and garlic did I think about the poor lonely pepper in the fridge. As you can tell, I have a large can of Tomato Puree and a can of diced tomatoes. Both are in BPA free cans. 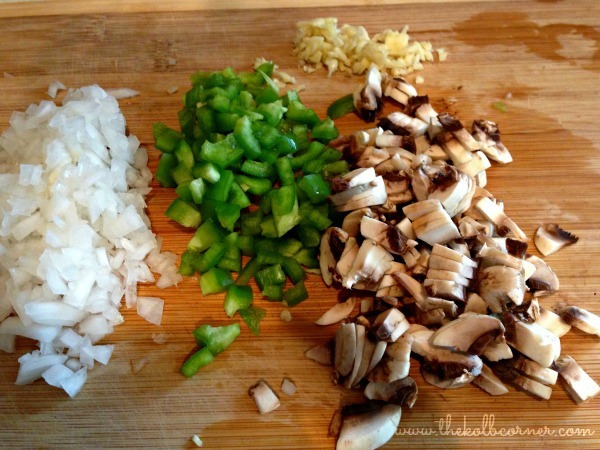 I also decided to throw in some veggies–onion, garlic, mushrooms and green peppers. I don’t like mushrooms, but I threw some in for my hubby. Not to mention they were starting to go bad. You can use all of these ingredients, or a combination of whatever you want. 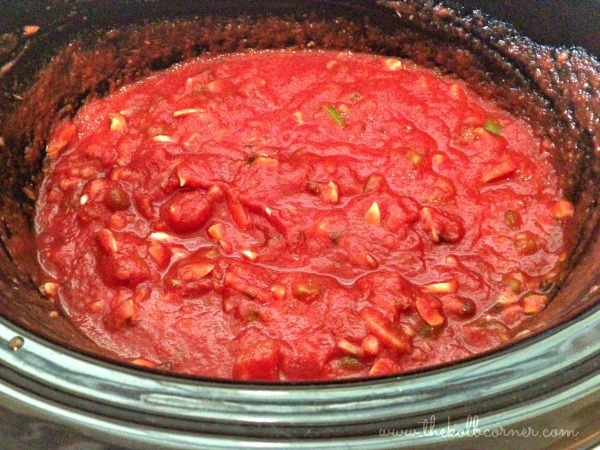 I like adding in fresh veggies and the diced tomatoes to really give it that restaurant marinara texture. 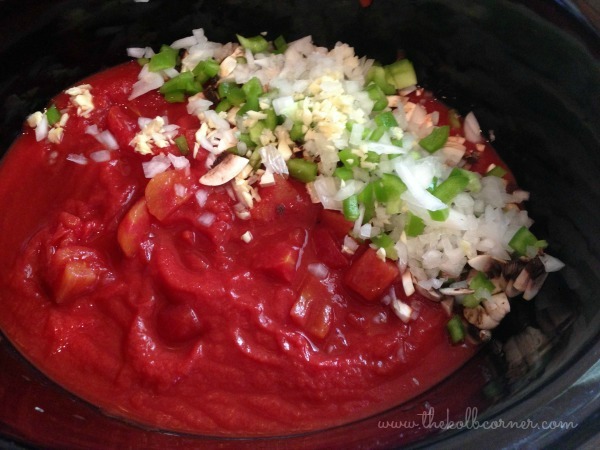 You could just use the tomato puree and ground seasonings if you like a smoother sauce. Your choice! 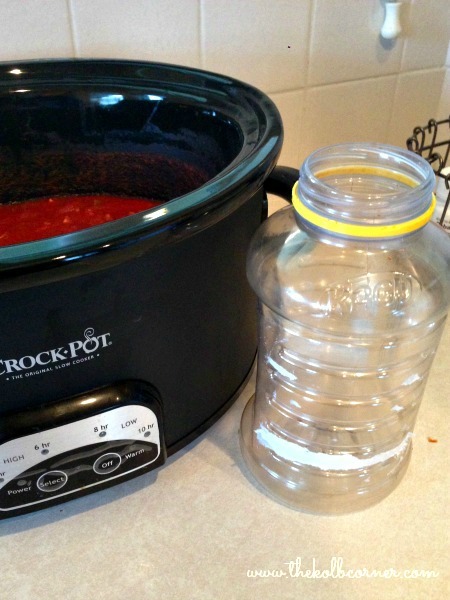 I dumped in the can of sauce and can of diced maters into the Crock Pot and turned it to low. And season to taste–I used Oregano, Basil, Paprika, a SMIDGE of Cayenne for some spice, and some extra Garlic Powder. I LOVE Garlic. You could get creative and throw in some Parmesan too. …and let it simmer away on LOW for about 5-6 hours. Don’t let it burn! Basically you just want to make sure the veggies are tender. If you didn’t use veggies, just let it go for 3-4 hours or until the spices have been incorporated thoroughly. I happened to save an old Ragu jug for freezing chicken broth in, so I decided to go ahead and store my marinara in there. I keep mine in the fridge since we eat it so regularly, but you could freeze yours in ziploc bags to keep it longer. 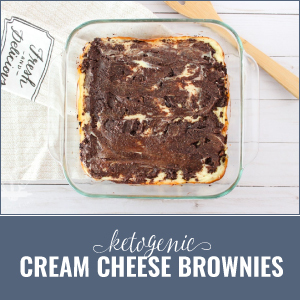 Double the recipe if you want to make a large batch. 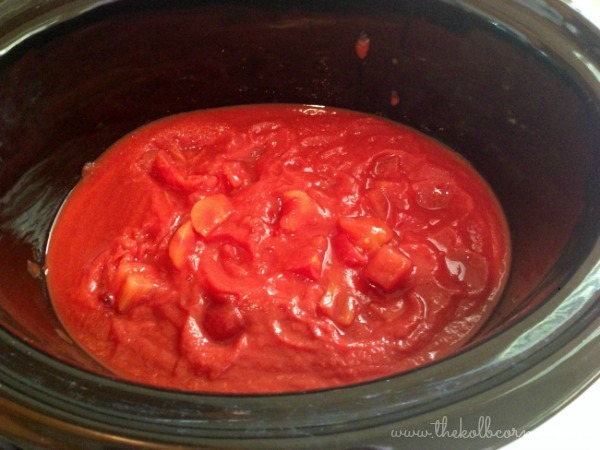 Pour contents of canned tomato puree and diced tomatoes into Crock Pot. Turn to low setting. While it is warming up, chop up veggies. 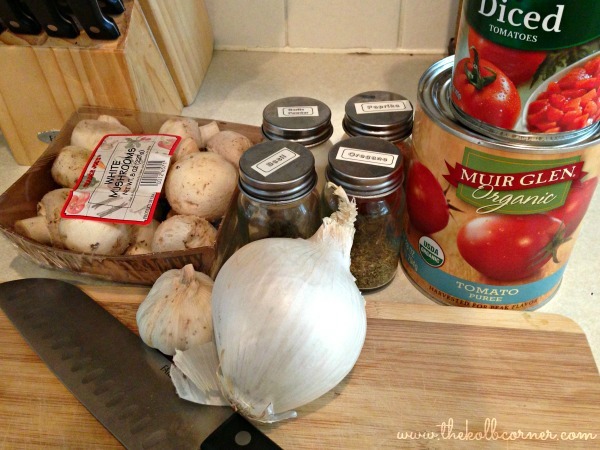 Place veggies and spices into Crock Pot. Cook on low for 5-6 hours or until veggies are tender. Pour into storage container or freeze in Ziploc bags for future use. Yum, I just pinned this for later. I love pasta and am always looking for another good recipe. The best part is you can add or not add whatever you want to it! Thanks for stopping by! So much better than making it on the stove! Thanks for stopping by! Thank you for linking up to Farmer’s Market Friday this week! 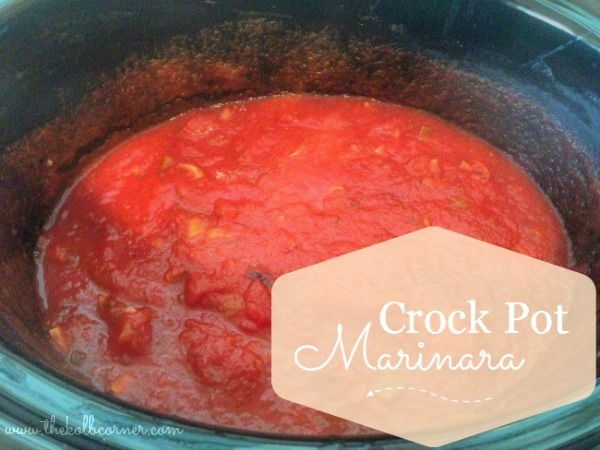 Marinara Sauce in the crock-pot sounds like a lovely idea! 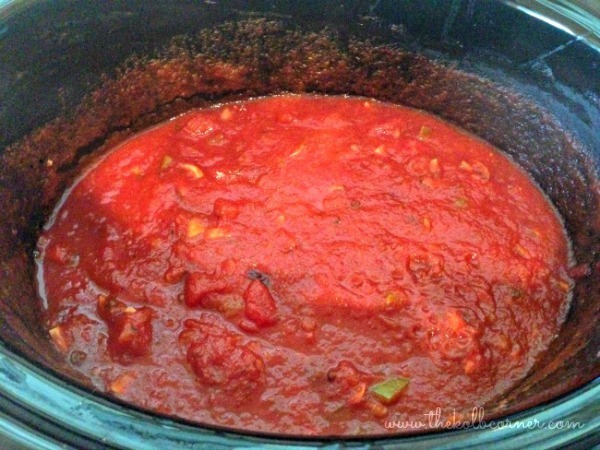 We make huge batches of tomato and meat sauce a few times a year to store in the freezer, but this would be great for the times when I can’t hang out near the kitchen all day! I love ANYTHING that can be made in the Crock Pot–so much easier to throw the ingredients in and leave it! I look forward to linking up this week! What a great idea. 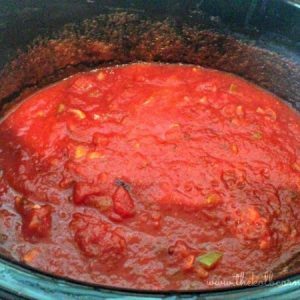 We eat and use a ton of sauce and it would be so easy for me to make large batches in the crockpot. Thanks for sharing on Merry Monday.